Want to send your loved ones off to work or school with a sandwich or wrap made from fresh sliced meats and cheese? Want to prepare sliced cheese and meat party trays for entertaining just like those found in the Deli and avoid their high price? Then a Nesco® Food slicer is what you need! Make your own cheese and meat rolls for your parties and slice your own lunch meat and cheese fresh while saving money. 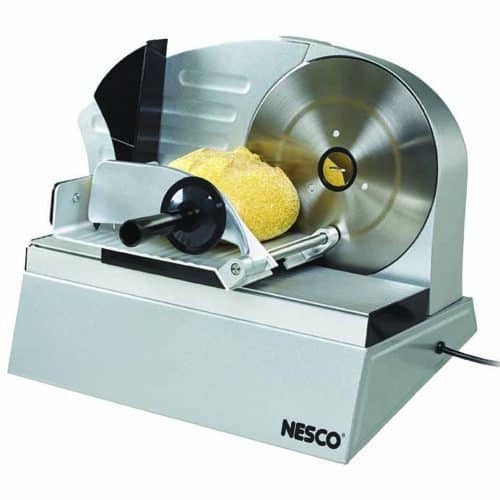 Nesco® Food Slicers are constructed of a rugged, die-cast aluminum housing combined with a unique tilted slicing surface to make slicing food easier. Each slicer has an adjustable thickness control ranging from deli-thin to 1/2″. The removable stainless steel blade produces precision cuts of many types of foods and meats. Designed for household use, Nesco® electric food slicers are perfect for slicing meats, cheeses, fruits and vegetables, making it easy to prepare sandwiches, salads, and party trays.